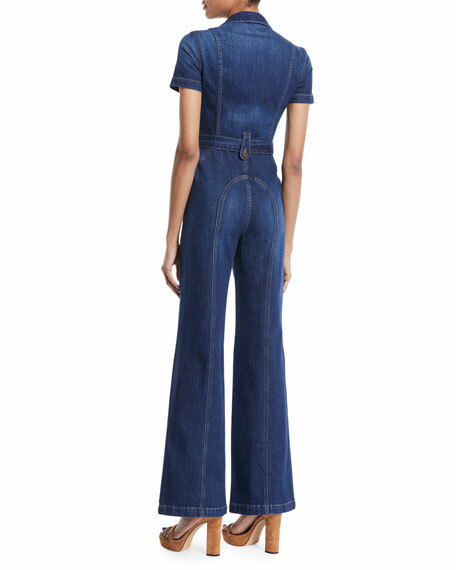 ALICE + OLIVIA JEANS jumpsuit in mid-tone denim with fading allover. Brunello Cucinelli satin track suit with monili racing stripe. Drawstring hood. Zip front. Blouson top. Smocked waist. Back besom pockets. Brunello Cucinelli satin track suit with monili racing stripe. Drawstring hood. Zip front. Blouson top. Smocked waist. Back besom pockets. Straight legs. Relaxed fit. Ankle-length. Acetate/viscose. Made in Italy. Model's measurements: Height 5'11"/180cm, bust 32"/81cm, waist 24"/61cm, hips 35"/89cm, dress size US 2. 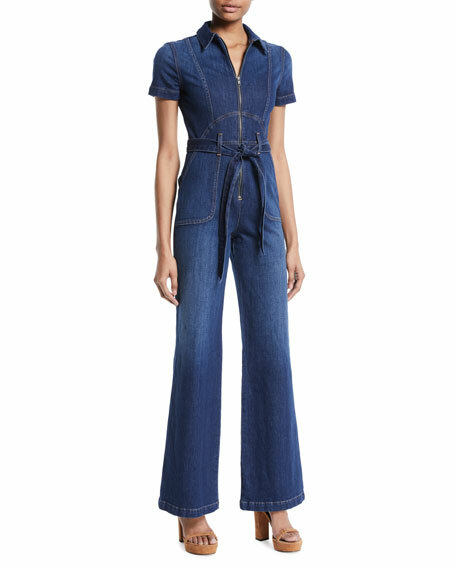 Brunello Cucinelli jumpsuit in crinkled cotton. Tiered top with ostrich feathers. Scoop neckline. Sleeveless; cut-in shoulders. Side slip pockets. Back welt pockets. Relaxed fit. Straight legs. Cotton/nylon. Lining, polyester. Made in Italy. Model's measurements: Height 5'10"/177cm, bust 32"/81cm, waist 24.5"/62cm, hips 36"/91cm, dress size US 2/4. Carolina Ritzler "Helene" short stretch-wool jumpsuit. Notched collar; button front. Half sleeves. Chest flap pockets; side slip pockets. Self-tie belt. Carolina Ritzler "Helene" short stretch-wool jumpsuit. Notched collar; button front. Half sleeves. Chest flap pockets; side slip pockets. Self-tie belt. Yoked back; box pleat. Relaxed fit. Wool/spandex. Lined. Dry clean. Made in France. Model's measurements: Height 5'10"/177cm, bust 32"/81cm, waist 24"/61cm, hips 35"/89cm, dress size US 2/4.